FULTON, NY – Oswego County Opportunities Nutrition Services recently relocated its Constantia Dining and Activity Center to a new larger location. Guests enjoy lunch at Nutrition Services new Dining and Activity Center at The Vanderkamp Center in Cleveland. OCO’s former Constantia center relocated to the larger; handicap accessible Vanderkamp Center February 8. Now held at The Vanderkamp Center, 337 Martin Road in Cleveland, the facility offers many new benefits to those that attend. “The Vanderkamp Center is a much larger space and allows us to comfortably accommodate more people” said Dining and Activity Site Manager Deirdre McCarthy. Its natural surroundings feature trails, a beautiful view of the lake, and an outdoor picnic area. The building is handicap accessible making for easy mobility and there is plenty of parking. McCarthy added that the transition to the new location has gone smoothly. “We settled into our new location February 8. Our volunteers and guests have adjusted nicely and all of our usual activities are up and running. 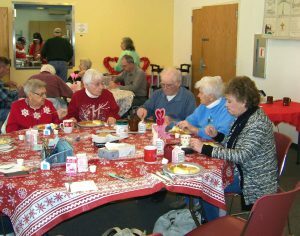 In addition to the hot, nutritious lunch, our guests enjoy card games, bingo, Yahtzee, Scrabble, putting puzzles together and just enjoying each other’s company,” said McCarthy. The Dining and Activity Center has hosted as many as 30 guests daily and with the new larger location, McCarthy is looking forward to hosting more. “The volunteers and I have created a very welcoming and friendly environment. Our guests enjoy their time here and many attend two or three times a week. It’s always nice to see new faces at the center and I hope that our new location attracts even more,” said McCarthy. Amy Roland, director of Nutrition Services, shared that we are in the planning stages for a spring open house. “We would like the community to enjoy center festivities along with a meal,” she said. OCO’s Dining and Activity Center at The Vanderkamp Center is open Tuesday, Wednesday and Thursday from 11 a.m. to 2 p.m.
OCO offers bus service to the Vanderkamp Center on Thursdays. Arrangements for pick up and reservations to attend lunch can be made by contacting McCarthy at 315-720-9732. Meals are prepared and provided by OCO Nutrition Services. In addition to the Dining and Activity Center at Vanderkamp OCO Nutrition Services hosts Dining and Activity Centers in Fulton, Mexico, Hannibal, Parish and Phoenix.